Yes, there's a reason why we put Jagapathi Babu's name ahead of the Superstar's in the cast (and no, it's not alphabetical order). We will let the meow out of the bag right away. Surprise! Ta da!! This isn't a standard issue Rajni flick. For everyone who's been waiting for one with a "story", and "logic", this is possibly as close as it'll ever get. He doesn't make an appearance till about a quarter of the movie has elapsed in setting the scene, and when He is around, He is basically playing Himself (okay, we will stop messing with the capitalization now.) Such is the leela of the Lord (that was the last one, promise). Kathanayakudu is the 21st century re-telling of a story that is several centuries old. Actually scratch that. Kathanayakudu is the 2008 retelling of a 2007 Malayalam film. In a GRE paper, it would nicely fill the blank in Chandramukhi : Manichitrathazhu :: _________ : Katha Parayumbol. Balu (Jagapathi Babu) is an impoverished barber. Although he can barely make ends meet, life in the company of his wife Sridevi (Meena) and children is pleasant and carefree in a pastoral way. His inability to run his business and the taunts he has to hear from his one-time employee and current competitor Cutting Kantha Rao (Sunil) notwithstanding. Life is disrupted by the arrival of a film crew in the village, followed shortly by a svelte Nayantara (Nayantara) and the reigning Superstar of the era, Ashok Kumar (Rajnikanth). While the shooting gives a fillip to the local economy, what really catches the villagers' fancy is the fact that Ashok Kumar and Balu were supposedly bumchums in school. Everyone who had so far ignored and insulted Balu Barber finds reasons to cozy up to him. Thick and fast they came at last, and more and more and more. Kantha Rao wants to be photographed with Ashok Kumar for conjugal reasons (don't even ask! ); Dharmaraju (Dharmavarapu Subramaniam) the local loan shark wants to produce a movie starring the man; the local school wants him to be chief guest at their annual day event; and so on. Balu himself is conflicted. One part of him desperately wants to meet his childhood friend, while the other is worried about whether the great man will even recognize him, and whether he can even penetrate the phalanx of protectors and get up close and personal. This, by the way, forms the acting piece de resistance of Kathanayakudu. Jagapathi Babu is possibly perfectly cast as the hesitant friend, and there is a moment just before the interval when he is trying to unsuccessfully catch Ashok's attention that is gut-wrenching. And so it goes. Everyone can guess with about 78.37% accuracy what is going to transpire (the story after all has been gathering dust for all those centuries). So what makes Kathanayakudu remarkable is that in spite of this, you can actually sit through the entire movie and not lose interest in the proceedings. Which basically goes to show how timeless the whole childhood friends separating idiom is; how well written the story is (thanks to Sreenivasan, credit where credit is due) and how compelling the performances are. Jagapathi as we've said is the acting star of the movie, Meena is good, and everyone else is adequate. Very briefly, the music is nothing to write home about, all Nayantara does is to be Nayantara, no dishoom dishoom whatsoever (thank heavens! ), and sadly much of the comedy is labored, although there are flashes of brilliance. Not much happening in the visual department either, except for a surreal and unscientific dolphins-jumping-out-mountain-lake bit and a fairly bizarre song involving mustachioed South-Indian extras pretending to be ancient Egyptians. Makes you go "Mummy!!!" Ha ha. Rajni himself has an odd role to play, for much of the time it appears that he's his real-life self (with snazzy wigs, of course, lest audiences collapse from heart failure). He gets a chance to reprise quite a few of his star turns, deliver a couple of sermons here and there, and basically show the world that he's "one of us"; no over-the-top stuff. Sort of. It is a Rajni movie after all, and not remembering that will be akin to treating him like an elephant in the room. He does get his chance to do some real acting in the final minutes when he delivers a speech which, thanks to the way the story has built up so far, might surprise you by blurring your eyes with tears and/or causing a lump in the throat, depending on how mawkish you are (and who isn't when it comes to friendship?). All said and done, Kathanayakudu is eminently watchable if you go in without expecting too much of the usual Rajni masala and if you can stomach a good, clean, old-fashioned, slightly dragging, sentimental drama with which all of us can identify with in some way, if we've ever had close friends and can use our imaginations a little. Otherwise, give it a miss. Thanks to poor word-of-mouth, I was expecting a pretty lousy movie. It was probably because of this approach why the film exceeded my expectations and I would say it's worth at least 1 watch. I found Rajini's role refreshing without any of his regular razzmatazz. Come on guys...give the big man a break. Even he would like to experiment once in a while. Nice Movie! Surely Not the typical Rajini movie and surely not for dumb fans looking only for the usual Rajinisms and big dialogues. Simple movie, age-old but touching tale, nice performances, a lil bit of Rajini more of Jagapathi Babu makes it a very good watch. Boring is the word for the movie...really bores u like hell...as a die hard fan of Rajni kanth I'm saying this...really bad Script and Direction...please do not waste your precious time and money on this. 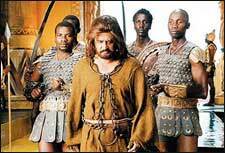 rajni was laughable at the most in this movie with his cheap styles and mannerisms. he has to deliver otherwise looks like spoiled child of tamilnadu unable to bear for the rest. fullhyd.com has 700,000+ monthly visits. Tell Hyderabad what you feel about Kathanayakudu!